New Monte Carlo 100% Plastic Playing Cards – Available Only from Kardwell International! Produced for us by Gemaco, our brand new, exclusive Monte Carlo back design playing cards are professional quality. Completely washable and extremely durable, these Playing Cards hold up hand after hand. 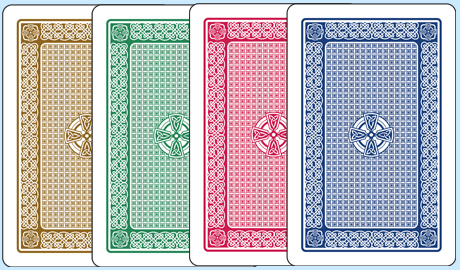 Narrow size red/blue and green/brown two-deck Monte Carlo Playing Card Sets are available with regular or super index pips. Sale Price: $14.95. Was $24.50. Save 39%!